The AnimeJapan stage event for the Starmyu series announced new cast members for the previously announced 3rd season, who are new Kaou-kai members. The anime will air on Mondays at 10:00 p.m. via Tokyo MX, followed by BS11, KBS Kyoto, and Sun TV starting July 1. U-NEXT will also stream the anime. 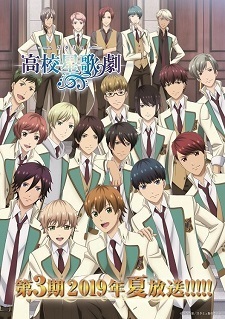 really nice seiyuus are lined up! can't wait for this! Wahaha, an amazing cast for the new kao-kai. Can’t wait for this and the news songs! Liking the cast for the new Kaou-kai, looking forward to their version of the Kaou-kai song. NamiDai voicing another red-haired omg. Really happy the new boys look great and perfect new cast again. I can already feel the tension. Can't wait for all the new songs and dances! They keep bringing another big name's seiyuu.